The Traveler… Mexican irony… dirty dancing prohibited! Today I traveled back to Boston by the means of The Boston Traveler and Evening Herald dated May 5, 1914. 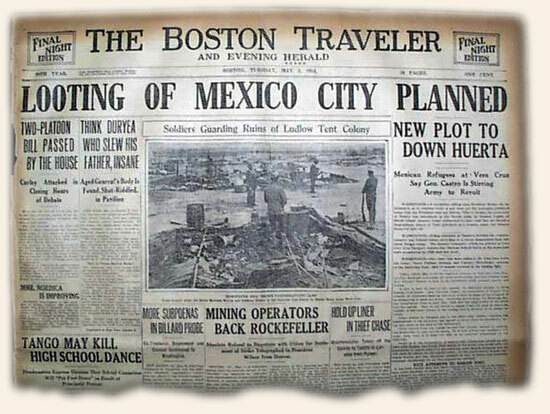 There I found a banner headline (see below) “Looting of Mexico City Planned”, with subheadlines, “New Plot to Down Huerta” and “Mexican Refugees at Vera Cruz Say Gen. Castro Is Stirring Army to Revolt.” How ironic to have this headline on the day of Cinco de Mayo — typically a special day of celebration in Mexico! Also… The Boston school systems were being faced with a new dilemma… the dance craze, the tango! Due to this dance and other such “modern dances”, the headmasters were not going to take any chances with having these dances performed and were putting their foot down and cancelling all of the dances. And 3/4 of a century later, “Dirty Dancing” makes millions upon millions! Additionally… The Leo Frank murder trial continues, with testimony that includes the accusation that he paid someone to lie for him.